Findlay Vinyl safety covers are some of the best on the market. 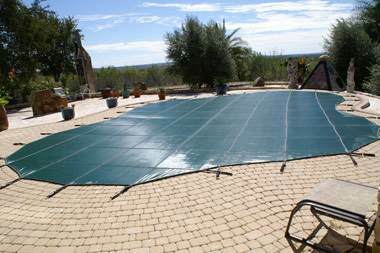 Most inground pools that are not installed with a retractable cover are equipped with a winter safety cover. Though a safety cover can be installed and removed during the season, typically owners will install the cover in the fall when the pool is closed and then remove them in spring for the season. They are initially installed by placing brass anchors in the concrete or paver deck for the cover to hook to. The brass anchors are retractable and sit nearly flush to the deck when the pool is open for swim season. The cover is connected to the anchors with straps and springs every three feet, on all four sides. The straps are adjusted so that the springs keeps the fabric taut. Winter covers are available in custom and stock versions. Learn more by clicking here.